In the practice of Feng Shui, there are many formulas such as Bagua 8 Aspirations Theory, 8 Mansions and Flying Stars that could help us increase our love luck, improve existing relationship and increase harmony in marriages. However, very few had realized that there is an ancient formula in Chinese Astrology/Zodiac, based on the year pillar of the the 4-Pillars, that could be adopted together with those feng shui formulas to further heigthen love attraction and increase more options leading to marriage luck. This formula is known as the "Tao Hua Love" Formula. Translated in English, it is called Peach Blossom Formula. One may be wandering what is the difference of applying this formula compared to the rest such as Bagua 8 Aspirations and Flying Star? The answer is simple. The love locations identified by those formulas will affect the whole family. However, the "Tao Hua Love" formula finds ones own personal location of love for the specific person only. This amplifies the love luck for the specific person further. When the "Tao Hua" Love Luck is activated, one will become very attractive and popular, that could lead to many dating activities, jazzing up friendship and inviting desired proposals. However, it has to be warned that this formula should not be misused for those who are already married. If this formula is misused for married couples, it could attract third parties and ruin family harmony. Unless, you want to rekindle your marriage life and is firm that you will not be lured by 3rd parties that you are advised to use this formula. 1. Singles looking for love, friendship and proposals. 2. Attached and am waiting for marriage proposal. 3. Those who are detached and seeking new love and relationship. 4. Those who are seeking to select from more options before marriage. 5. Singles who simply want to create popularity, attractiveness and fame. The formula is shown in the table below. First, identify your personal zodiac or animal sign based on the lunar calendar. You may check that out in the table at the bottom of this page. Each zodiac group will identify one "Tao Hua" love luck animal and a direction to place the animal. The big tai chi and small tai chi should again be applied here. The big tai chi refers to the whole house or whole building, while the small tai chi refers to rooms such as bedrooms and living rooms. First activate the "Tao Hua " direction of your own bedroom with your "Tao Hua" love luck animal. Then if convenient, also activate the "Tao Hua" direction of your living room, study, dining room and even at your workdesk. Besides that, one can also wear your peach blossom luck animal on your body to activate love luck. Figurines of rooster, horse, rabbit and rat carved from natural stones. They emit genuine earth energy that enhances love luck. Pendants of rooster, horse, rabbit and rat carved from natural jade can be worn to enhance love luck. Actually activating the "Tao Hua" directions with the associated animals is not sufficient yet. 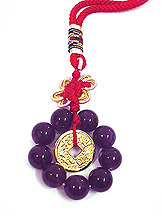 One need to also hang the Nine Amethyst Amulet in their "Tao Hua" directions. The nine amethyst is a secret "Tao Hua Amulet" to harness "Tao Hua" energy. One can also carry along this amulet so that they will never miss out any single opportunity of meeting their desired partner wherever they go. For those who love flowers, you can also apply the Flower Activation method to it. Prepare colorful flowers, preferably in three colors such as pink, orange and purple. Then insert "four stems" in total into a round vase. There must be no more or no less than 4 stems. If in the west, choose a white vase, in the south a red vase, in the east a green vase and in the north a blue vase. Otherwise, just use a transparent vase that could fit all the four directions. Fill the vase with water and place it in the "Tao Hua" direction. Remember to avoid white colored flowers, flowers that gives bad odour and flowers that have thorns such as roses. Of course the best is to prepare the Peach Blossom Flower itself if you can find them. Check the table for your personal zodiac according to your birthdate and year.